This past Sunday I asked the congregation what are some of the central beliefs of the Church… the non-negotiables, so to speak. I was absolutely delighted to hear one of my friends say, “the Trinity!” Yes! Yes, yes, and yes! As a committed advocate of trinitarian theology, I was quite happy. And for a moment, I felt quite successful as a pastor. The Trinity is certainly a complex subject. While there are many texts which, in my mind, indicate that the doctrine is essential for the Christian faith, I’m also quick to acknowledge that there is a level of mystery involved in understanding God that I want to talk about it with a lot of humility. And while I’ve read a lot of books about the Trinity, I must say that some of them are either excellent (e.g., Fred Sanders’ The Deep Things of God or Michael Reeves’ Delighting in the Trinity) and others pretty frustrating. Some are even really confusing. Yet rarely do I read a book on the Trinity and find myself so hungry to read more because of how fascinating it is! At least not until Rodrick K. Durst’s Reordering the Trinity: Six Movements of God in the New Testament. Exegetically responsible. Theologically informed. And missionally creative. Durst’s central claim is that the way in which the NT orders the Trinity has theological reason. The traditional ordering, “Father, Son, and Spirit,” is not the only way that the New Testament orders the Trinity. Durst believes there is reason behind this. The Sending Triad: Father-Son-Spirit as the Missional Order. The Saving Triad: Son-Spirit-Father as the Regenerative Order. The Indwelling Triad: Son-Father-Spirit as the Christological Witness Order. The Standing Triad: Spirit-Father-Son as the Sanctifying Order. The Shaping Triad: Father-Spirit-Son as the Spiritual Formation Order. The Uniting Triad: Spirit-Son-Father as the Ecclesial Order. 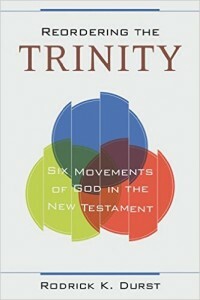 Yes… if you are even remotely interested in the Trinity than you will want to read this book! Finally, in addition to a couple appendixes (five, to be exact), Durst ends with how these concepts are applicable in the life of followers of Jesus in “everyday worship, life, and ministry.” You won’t agree with all of Durst’s arguments and you’ll likely have a lot of questions, but you won’t be disappointed. I highly recommend picking up a copy!